Cocktail luminaries Ryan Fitzgerald and Todd Smith, who helped kick off the drinks program at Bourbon and Branch in the aughts, bring a subtle and well-balanced approach to simple but elegant, three- or four-ingredient drinks at this narrow bar. 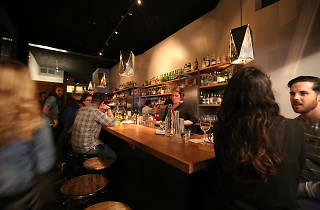 The design of the sophisticated spot incorporates recycled materials, including charming gin-bottles-turned-candle-holders and corroded mirrors fashioned into shimmering chandeliers—even the top of the 15-seat bar is made from wood reclaimed from a tree that was scheduled for removal outside a nearby school. Standout tipples include the smooth and smoky Whisky in Church (scotch, oloroso sherry, maple-smoked pear bitters), the clean and savory Casino Perfecto (blanco tequila, cappelletti aperitif wine and amontillado sherry), and the refreshing, slightly bubbly Tarragon Collins (gin, lemon, tarragon and soda). 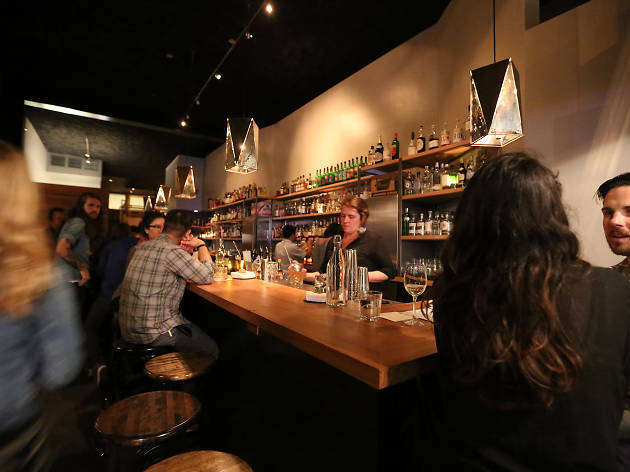 The back bar is deep with spirits for sipping, and particularly well-stocked with tequilas (mescals, specifically). To go with the cocktails are rich bites, such as the mapo “sloppy joes” made of tangy pork stuffed into fluffy white Chinese bread, cheese boards, kimchi fritters, and trays of pickled seasonal vegetables.